Paal poli - fried maida puris are soaked in thickened milk, served warm or chill as a dessert. This is made during festival time of vinayaka chaturti, avani avittam, varalakshmi vratam, Ugadi. For me, it's one of my childhood favorite. So whenever I visit amma's place, my first request to amma would be to make these paala puri. Unlike Puran poli, this require less cooking time. It can done in half an hour. It is not a common dessert recipe, so whenever you throw any party or invite guest for feast please give a try to paal poli. Your guests would appreciate you for sure. 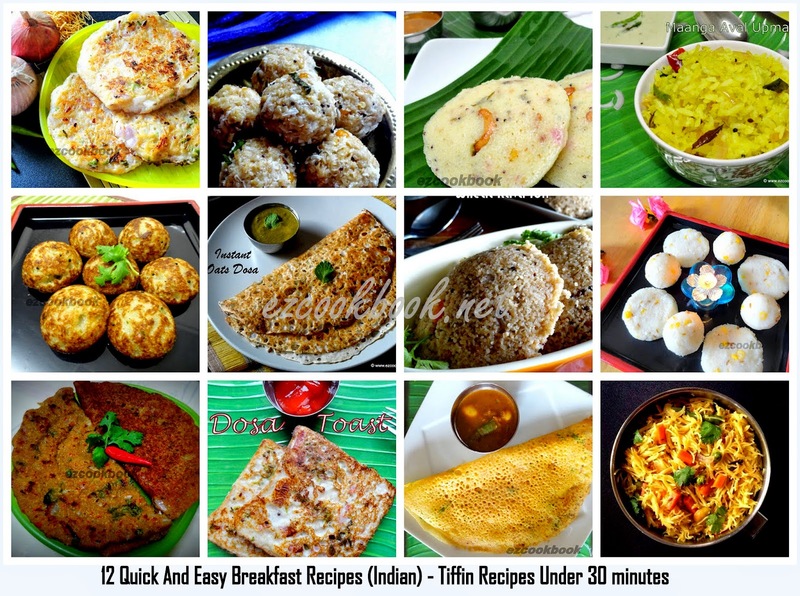 There are different versions being followed to make this recipe in each state of India. Some people prepare milk base in a different way by grinding coconut and kus kus/poppy seeds. Also sugar syrup is used instead of milk and popularly known as jeera poli. But the recipe which I'm sharing here is absolutely simple and easy to try at home. Imagine rabdi which we use for rasmalai, it's the very same milk base we use here for paal poli. In a mixing bowl, combine flour, ghee and salt. Add little by little water to make a stiff dough. Allow it to rest for 30 minutes. Knead the dough once again, divide the dough into 12 equal size small balls. Roll out each ball to thin puri. Fold half way. Arrange in the tray. Meanwhile, heat oil to deep fry the puris, once oil is hot enough, start frying puris one at a time. Do not deep fry until golden colour. Drain out immediately once sizzling sound stops. Also remember to fry puris in low fire. Now fry all the puris in batches drain in kitchen tissue. Heat milk in a sauce pan and once it starts to boil nicely, reduce the fire and simmer boil until milk thickens. 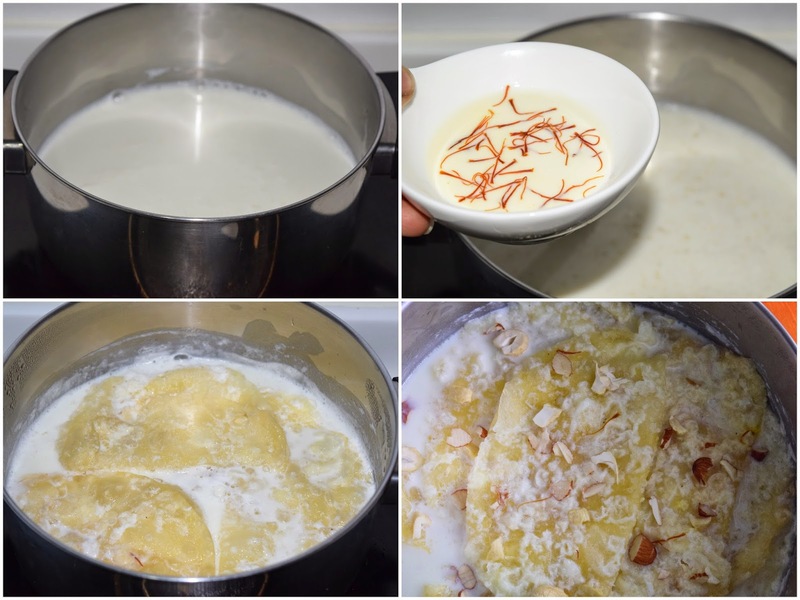 While doing this, take two spoon of milk from it in a bowl and put the saffron strands in it. Once the milk reduced of 3/4 th of level from original quantity, add the sugar and stir well to dissolve completely. Now throw in a pinch of cardamom powder and saffron milk. Mix well and switch off the fire. Immerse the fried puris into the hot milk and allow it to soak for an hour. Serve warm or chilled decorated with almonds and cashew nuts as per taste. The dough should be stiff and not runny/sticky. I used 1/4 cup of water to knead a cup of flour. You need to roll the puris very thin, thus helps to absorb milk faster, so that it would be easy to cut with spoon while you serve. Fry the puris over low fire and don't fry till golden color. Remove immediately once fried. The fried puris can stay crisp for 4-5 days. Heat milk and soak fried puris before serving. If the milk was left a lot, shallow fry few bread slices in pan using ghee and soak it in milk. Enjoy this quick dessert. This is in my to do list.. It came out so perfect! Happy Ugadi!